UK broadcasters tackle Netflix threat with £125m Freeview investment | What Hi-Fi? New Freeview Play development offers some security to the future of free-to-air TV. BBC, ITV, Channel 4 and network operator Arqiva – the four shareholders of Digital UK – have agreed to invest £125m over the next five years to see Freeview Play become a ‘fully hybrid platform’. Freeview Play (which you can read all about here) is essentially a three-year-old, subscription-free platform offering 70 live channels and the full suite of UK TV catch-up apps (such as BBC iPlayer) under one parasol. The service is built into the likes of LG, Panasonic, Sony, Philips and Toshiba TVs, as well as a handful of set-top boxes - and, according to Digital UK, is part and parcel of over 3.5m products already purchased in the UK. 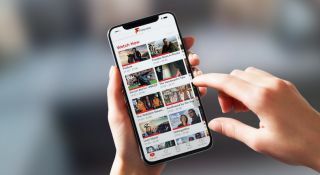 The investment will see the fruition of a long-overdue Freeview Play app later this year, enabling users to access the service’s live and on-demand content from their smartphone or tablet. In addition, a new ‘Restart’ functionality will allow users tuning into a programme mid-way through to watch from the start. And last but not least, the Freeview Electronic Programme Guide (EPG) will also receive some tweakery to improve content discovery, and navigation through voice search. The new, forthcoming functionality follows a recent Freeview Play update that sees on-demand viewing infiltrating the live TV experience, and can only be a positive thing in the fight to sustain free-to-air TV in a landscape increasingly influenced by video streamng giants such as Netflix and Amazon.